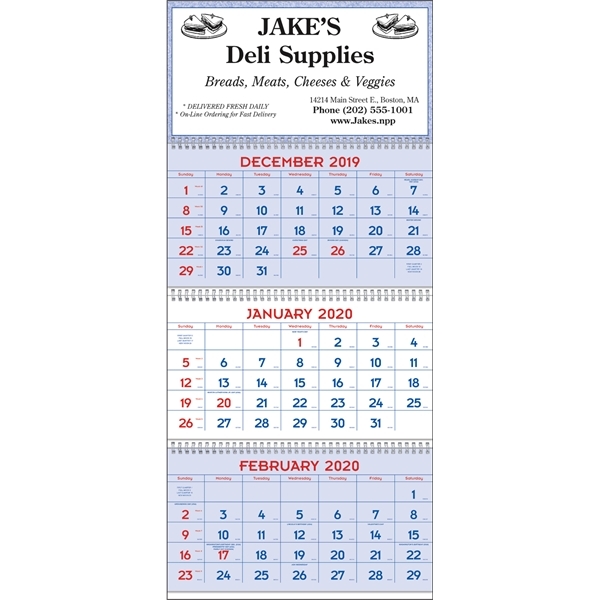 Commercial Planners 2020 Calendar - Red & Blue. Huge ad area for great exposure all year long. This 14 month calendar runs from December through January. The 4-panel/3-pad style is twin-looped and has a large imprint area. Grid red & blue matches 186 red and 286 blue. All 3-grids include Julian dates. Top markets: manufacturing, retail, transportation. Material: 50# offset/16 pt mount. Product Size: 13"w x 8"h. Product Size Open: 13"w x 29"h.
Size: 13 " x 29 "
Option for sliding date indicator.